Stonewall Sporthorses are versatile. While most are trained and pointed toward careers in the English disciplines and driving, others excel as pleasure mounts, trail horses and in traditional Western events. One of these is the bright chestnut leopard stallion Stonewall Kid Cody. Kid Cody comes by his western talent naturally, through some high-powered influences from his dam, bred by Myrtle Brown at the end of her celebrated eighty year career with spotted horses. The last stallion she used was the talented and regally bred Heza Dart, a son of Hesa Commander, by Commander King. All of these stallions were successful reining and cutting Horses, and passed their talent along. The dam line was a long one of Myrtle Brown’s, tried and tested through decades of performing. Kid Cody was bred by Stonewall Stud and sold as a weanling to the farrier that cared for the Stonewall Sporthorses in the 1990’s. 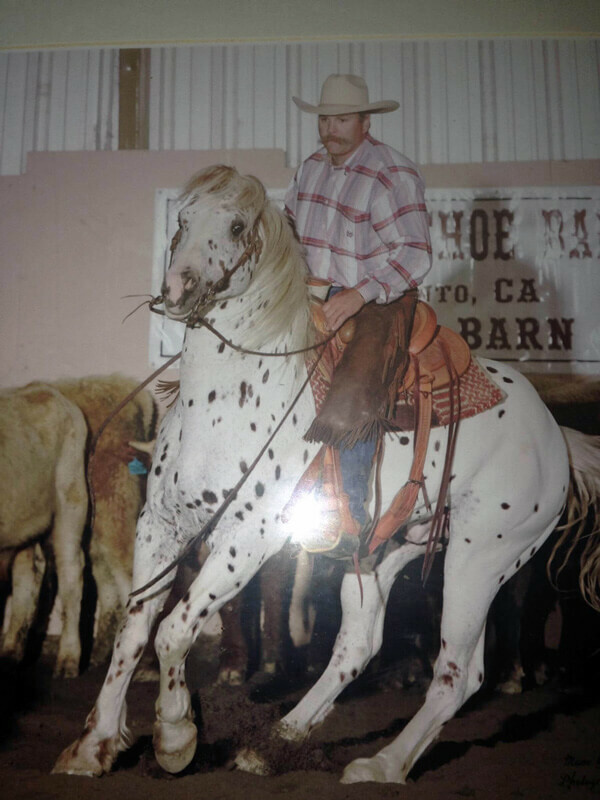 Jeff Stich was known to dabble in jumping and dressage, but he was a born and bred cowboy who reveled in the Western events. Trained exclusively by Jeff, Kid Cody became an eye-catching feature at team pennings, cutting and reining events throughout Northern California. Kid Cody became a successful regional sire. His daughter, Stonewall Starlight, produced by the throughbred mare Dona Franisca was used in the Stonewall Stonewall Sporthorse breeding program. Starlight is now owned by Lee Ann Ribble in Colorado. For his prowess and success, we are proud to honor Stonewall Kid Cody as a Stonewall Sporthorse Champion in Western riding and cattle events.